The World Bank is expected to approve Thursday its new “Environmental and Social Framework” which civil society groups say weakens human rights protections and will likely endanger the very communities the safeguards are intended to protect. At issue are a series of contradictions which strengthens the oversight authority of the very governments that are pushing the mammoth development projects typically opposed by poor, Indigenous and working class communities. The likely result, critics say, will be more conflicts and more corpses, doubling down, as it were, on 2015, a year which the environmental NGO Global Witness says was the deadliest recorded year for environmental defenders, with an average of three slayings per week, worldwide. This year already saw the March 3 high-profile assassination of Berta Caceres an Indigenous rights and land defender from Honduras who tirelessly campaigned against a widely unpopular dam project once funded by the Bank’s financial lending arm, underscoring yet again the violence often associated with international development projects. In fact, World Bank President Dr. Jim Yong Kim was widely criticized after he gave a talk on April 6 at the Union Theological Seminary in New York City suggesting that incidents like Caceres’ death, which caused condemnation and mourning around the world, are the cost of doing business. Kim said that “you cannot do the kind of work we are trying to do and not have some of these incidents happen,” prompting a letter from 313 organizations and 31 individuals condemning the remarks. But activists are skeptical, to say the least. “Our concerns have not been adequately addressed,” said Prabindra Shakya, human rights program coordinator of the Asia Indigenous Peoples Pact, or AIPP. The AIPP is one of scores of civil society organizations and Indigenous and community representatives—the Berta Caceres’s of the world—who participated in the World Bank’s four year review and consultation process as it drafted its environmental and social framework. Many of their recommendations fell on deaf ears. “The result of this review is a more convoluted, difficult to implement and in places contradictory set of standards,” said Helen Tugendhat, a policy advisor at the Forest Peoples Programme. For instance, Tugendhat explained that according to the new framework World Bank borrowers, in this case mostly countries, will be solely responsible for conducting the Environmental and Social Impact Assessment for projects, which determines whether a project will have “adverse or significant impacts” on Indigenous communities, a prerequisite for triggering whether free, prior and informed consent will be sought by affected Indigenous communities. This at the same shifts the burden of responsibility away from the Bank and allows borrowers, regardless of their track record of corruption or human rights violations, to bulldoze their way through projects without community consent, participation, or oversight. “This is inviting abuse, given the bank’s track record of lending to some of the most repressive governments in the world,” said David Pred, managing director of Inclusive Development International, a human rights organization. This underscores again how these “new standards move away from a rules-based system, rooted in a commitment to doing no harm, to a more aspirational and flexible set of standards,” as Pred pointed out. The World Bank is proving once again that business comes first and that human rights are an afterthought. “The underlying agenda was clearly to make the bank more competitive by reducing its environmental and social requirements prior to project approval,” added Pred. The Asia Indigenous Peoples Pact’s Shakya said that this lack of clear and tangible protections will put land and environmental defenders “at risk and fuel further conflicts” in countries that will “trample” on human, labor, and environmental rights, such as Kenya, Ethiopia, Uzbekistan, Peru, and Honduras. The Berta Caceres`s of the world spoke up, as World Bank President Kim implored, but their pleas were largely ignored. But in the World Bank’s 72 years, impunity is the status quo. We can only hope moving forward that community leaders who stand up to unfair and unsustainable development don’t meet the same fate of the slain Honduran community leader and Goldman Environmental Prize winner Caceres. 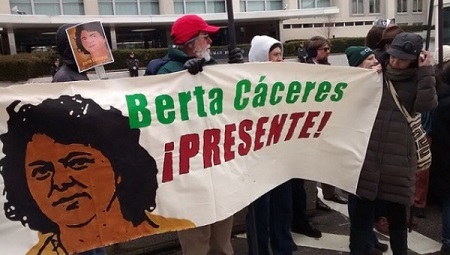 Photo: After the assassination Berta Cáceres in Honduras, human rights activists in Washington DC, protested at the State Department to honor her life and resistance. Source: SOA Watch/flickr. WASHINGTON—The World Bank’s Board of Executive Directors today approved a new Environmental and Social Framework (ESF) that expands protections for people and the environment in Bank-financed investment projects. The safeguards review included the most extensive consultation ever conducted by the World Bank. It concludes nearly four years of analysis and engagement around the world with governments, development experts, and civil society groups, reaching nearly 8,000 stakeholders in 63 countries. The framework is part of a far-reaching effort by the World Bank Group to improve development outcomes and streamline its work. In order to support the new framework—and meet additional oversight demands—the World Bank is on a trajectory to substantially increase funding for the safeguards. The new framework will promote better—and lasting—development outcomes. It provides broader coverage and access, and will benefit more people, especially vulnerable and disadvantaged groups. It will also strengthen partnerships with other multilateral development banks, development partners, and bilateral donors. The World Bank now begins an intensive preparation and training period (12–18 months) to prepare for the transition to the new framework. The framework is expected to go into effect in early 2018.